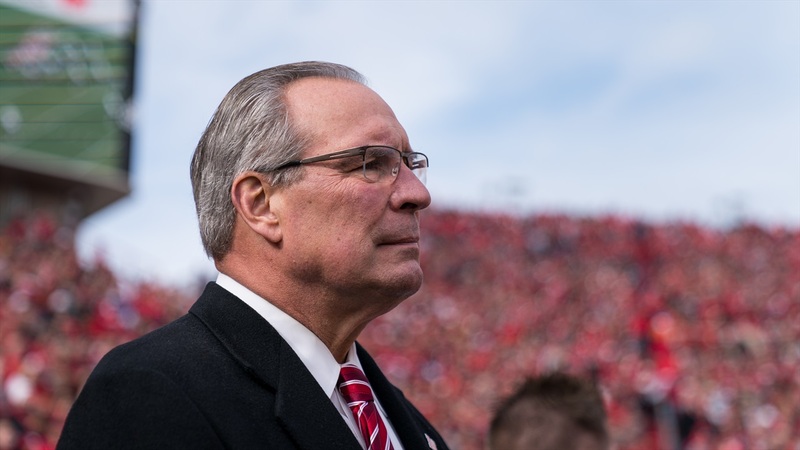 Bill Moos, Nebraska’s athletic director, covered quite a bit during his and offensive line coach Greg Austin’s trip to Gretna on Tuesday. One of the topics: scheduling. Back in May, Moos made comments on his radio show suggesting that the Big Ten might look at moving from a nine-game conference schedule down to an eight-game format. The Big Ten, along with the Pac-12 and the Big 12, plays nine while the SEC and the ACC each only play eight. Cause or correlation but neither the SEC nor the ACC has been shut out of the College Football Playoff yet; the Pac-12 and Big 12 have each been shut out twice in the CFP’s four-year history; the Big Ten has been most recently. But Moos slowed the roll on Tuesday. “No I don’t think we’re going to go away from nine conference games, what we have now,” he said when asked. Okay, so what do you want to see with those three nonconference games then? Recently, Virginia head coach Bronco Mendenhall said he wanted his Cavaliers to play the worst Power 5 team they could find. All jokes aside, he’s directly verbalizing something other coaches think but won’t say. There’s the school of thought that you take it easy in the nonconference so as to avoid any early season trip-ups and keep the team fresh for league play; or there’s the other side that says “I’ll play anyone, anywhere, any time.” Moos probably falls somewhere near the middle of the spectrum. And even though they’re a conference opponent and we were talking noncon games, Moos did want to make a point of bringing up Iowa. One of those ideas is, instead of reducing the number of conference games, changing the way teams from opposite divisions play each other. It’s a comment Moos has made before and Brandon Vogel explored it last month in Hot Reads. Moos also seems interested in reigniting some old flames with former Big Eight programs. Kansas and Kansas State have been recently mentioned, a pair of schools Moos says head coach Scott Frost came to him with, but other series could be on the way as well. “I really think that as we evolve through this scheduling, I think it’d be really great to schedule those old Big Eight opponents home and home, especially now that in today’s world we’re in different conferences,” he said. “We could be playing — like we’re going to — Colorado, who’s a member of the Pac-12, Missouri is a member of the SEC and Iowa State, Oklahoma, Oklahoma State, [and] the Kansas schools which are still in the Big 12. “Those are old rivals and old friends which, if we played, would get us exposure in three different conferences and I think that would be real good for us as we rebuild this program. Really, exposure is what it’s all about. Because of it, you might see a series with Missouri before you see one with Kansas, the SEC being what it is. In talking later about Frost and his staff coaching the Peach Bowl for Central Florida, Moos said he was happy to let the coaching staff do it because he knew how important that team and that season was to everyone, but he still found plenty of joy in the knowledge that the game would also serve as a three-hour infomercial for Nebraska football. Getting the Week 2 Colorado matchup in the 2:30 p.m. slot on ABC is probably a bigger deal than it’s being made out to be. Partially because the Huskers didn’t play at all on the network a season ago but also because it signals a step in the right direction. The Huskers will play several on national networks this season and those decisions were made before even seeing what Frost looks like on a Nebraska sideline. >> Moos is an advocate for an expanded eight-team playoff. While there are plenty of headache-inducing logistics to work out on getting to that front, Moos said he’d be in support of it after being “screwed enough” by the BCS. He called the switch to the current four-team College Football Playoff a step in the right direction. “What I was glad to see was to get to four, that’s a step,” he said. “There are some good things about eight. All five of the Power 5 champions are in and you get three at-larges, which this year would have included UCF. The problem is when do you play it and where do you play it and how do the bowls tie in to [it]? >> Asked if there might be any updates to the Huskers’ athletic facilities planned, Moos didn't want to say too much. “We’re always looking at investing in our facilities and we’re growing — our roster is maybe growing — and we don’t want to ever get to a situation where we don’t have room for our student-athletes to continue to work on their performance and become the best they can be,” he said. “We’ve got good weight training facilities as there are, but we’re always looking. We’ve got several things on the board that we’re just considering at this point. >> I asked Moos about the Oklahoma series less than 12 hours after his comments that the only thing special the Huskers were planning for the 50th anniversary of the "Game of the Century" was beating Oklahoma when the two meet in 2021. He had this sort of momentary grin like he knew I was asking because of his morning comments (comments that had already made the rounds) but didn't walk anything back. He simply said: "I think our fans are looking forward to it and I know our players are."